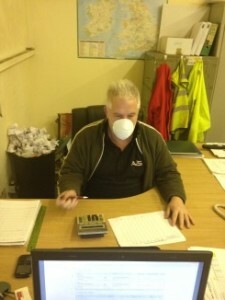 AJS Profiles Super salesman Bill Gould has been struck down with “Man Flu” this week and dont we know about it! We were all concerned about catching the dreaded man flu so we came up with a novel idea – see photo below. Although Bill felt poorly, he still turned up each day and quoted our customers Steel profiling and lumsden grinding requirements. What a trooper!! 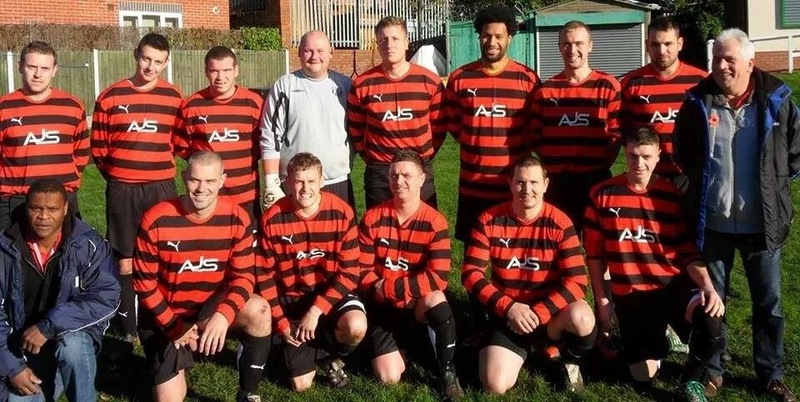 Below are photos of the Pig and Trumpet FC sporting their new kit supplied by AJS Profiles – Steel profilers and Lumsden Grinding specialists. 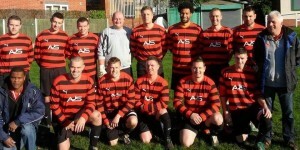 Pig and Trumpet beat top of the league!! The Pig and Trumpet FC recorded a fantastic 5-3 win at the weekend over the top of the league team. 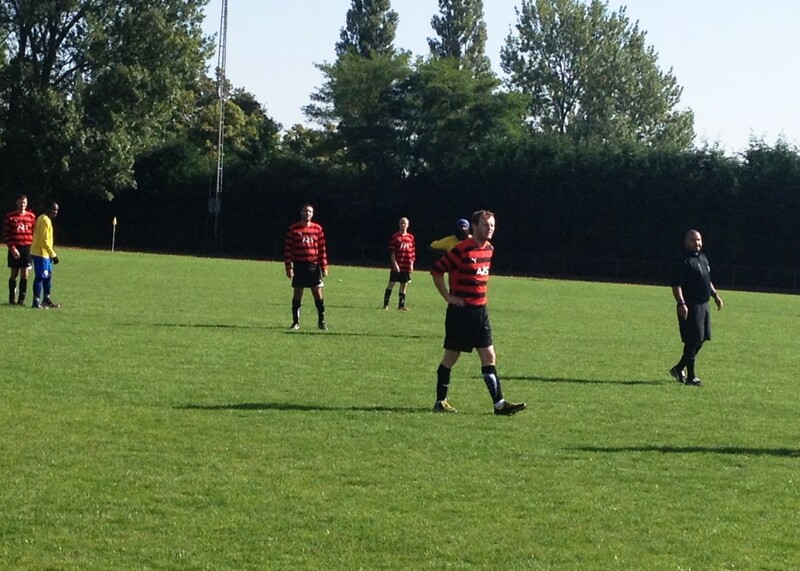 Trailing 3-1 just after half time, the boys dominated the 2nd half and scored 4 goals in quick succesion. 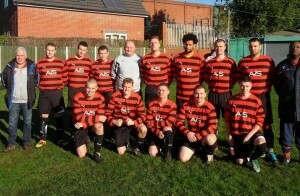 The Pig and Trumpet are sponsored by AJS Profiles – Steel profilers and Lumsden Grinding specialists. We have the requirement for an experienced Lumsden Grinder here at AJS Profiles. Applicants must have operated Lumsden Grinders for at least 5 years and Forklift truck / crane operating licences would be advantageous. 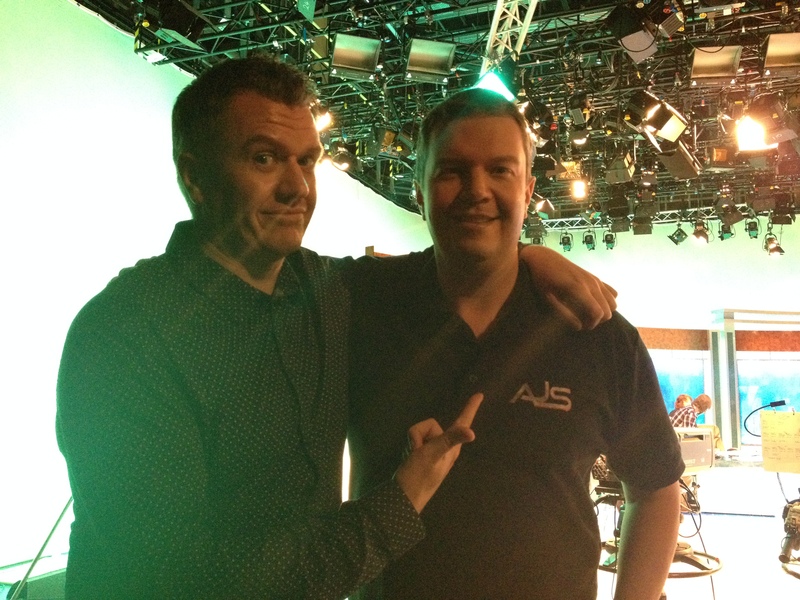 The Picture below shows AJS Profiles Director Neil Webb and Countdown Supremo Glen Webb before his Quarter Final match. 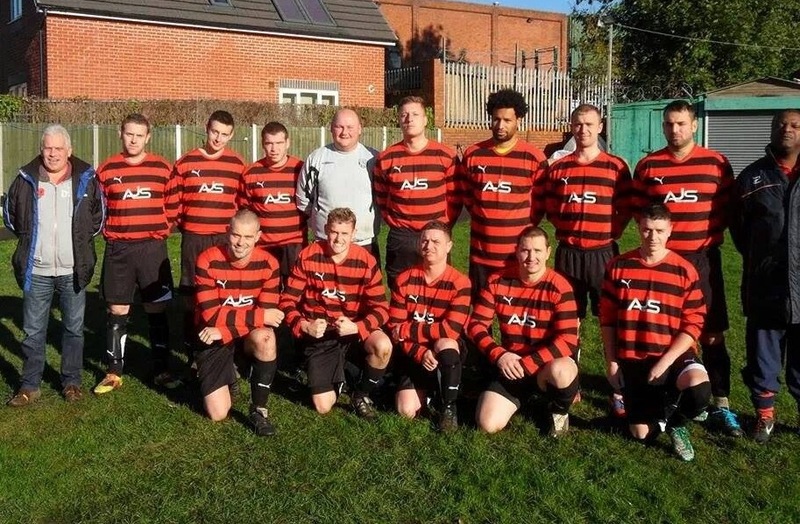 As you can see, Glen is wearing his AJS Profiles polo shirt with pride. Like Glen, AJS Profiles staff are fast to respond, intelligent, wear AJS profiles polo shirts and have a huge respect for Rachel Riley!!!! Call us today for your steel profiles and Lumsden grinding requirements. Our new wagon has arrived (at last),`and we now can carry another 4.5 tonnes of our steel profiles and lumsden ground plates per run. 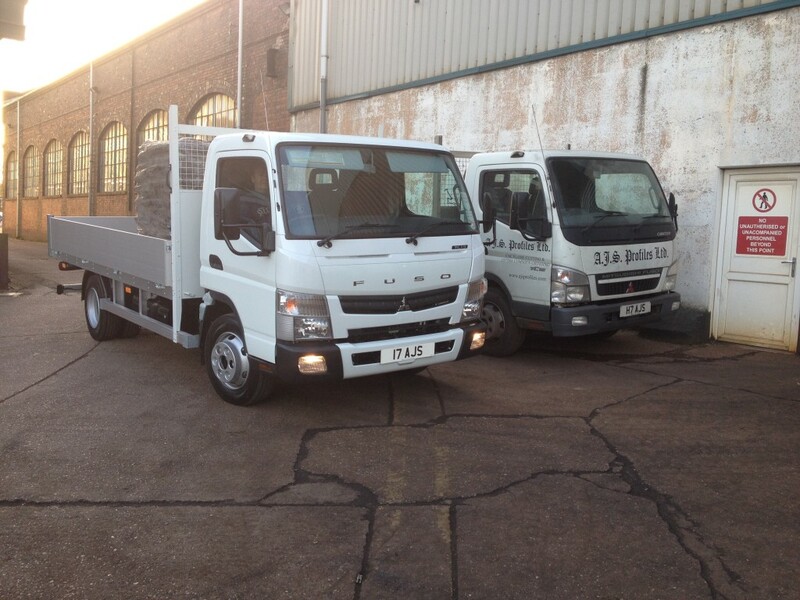 17 AJS – a 7.5 tonne Mitsubishi Fuso canter will allow AJS Profiles to deliver more tonnes of steel profiles quicker and keep up our 2-3 day lead times on Steel profiles and Lumsden Ground plates. Steel is an alloy of iron and carbon. While all types of steel contain carbon, a higher concentration of carbon is present in a particular type of steel, known as carbon steel. The higher concentration of carbon content present within this metal, makes it durable and strengthens its exterior, thereby, ensuring it’s long lasting ability. It is also known as wrought steel, and is the major component in the manufacture of many utensils, heavy machinery and industrial tools. This type of steel is quite malleable and can be formed into any shape. Most steel manufacturers look at their clients’ specifications and then design as per their customers’ requirements. Depending on the content present within steel, it is categorized into three distinct groups, namely; mild steel, medium steel, and high steel. All three categories of steel have their own unique applications and are used for various reasons, like medium steel is mainly used in making shafts and axles, while low steel is used on a larger scale in industrial applications. Industrial tools and machines are some of the basic objects, for which carbon steel is a significant component. Without the use of this strengthening metal, the production of these products would not be possible. Whether it is drill bits, cutting tools, nails, knives, or a single component of a heavy machine, carbon steel is used to ensure that these end-products remain strong and tensile. Although, carbon is the main reason for the durability of steel, however, there are other hardening agents which make it the most widely used metal, in the world. Manganese, chromium, and tungsten take up a certain part of this metal’s make up, which give it properties which are unique to it. Each type of steel’s properties differs, depending on the concentration of these substances within it. Stainless steel is the most famous type of steel, which is used in the production of many types of products. Mainly used to manufacture utility products and pipes, it can also be used for construction purposes. Not only is it rust proof, but also brittle, with a tendency to remain intact for long periods of time. This is the reason why this type of steel is used for durable products which are used for long term. The ever changing needs of the world and its industries have resulted in an increased demand for steel products over the years. Therefore, it becomes necessary to have businesses which manufacture steel with correct composition so that the rest of the industries can flourish. Steel is one of the most widely used materials used in the construction of buildings and manufacturing of machinery in addition to being used for various other purposes. Although there are many types and grades of steel available in the world, the most common form of steel is Carbon Steel. Having qualities, unique to its composition, carbon steel is used in almost all of the equipment you use in your everyday life. This specific form of steel has many advantages, which is why it is the most widely used metal all over the world. There are various types of steel, which are differentiated based on their composition. Depending on the carbon content present in a particular type of steel, it can be divided into three categories, namely: low or mild steel, medium steel and high steel; which also consists of ultra high steel. Steel is considered to be low or mild in nature when it consists of carbon, up to 0.16 – 0.29%. This particular type of steel has a lot of applications due to the fact that it is quite cheap as compared to others. This reasonably priced metal offers lower durability and is not as strong as its counterparts because of the low amount of carbon content present in it. Usually, this form of steel is used for construction as it is manufactured in larger quantities for mass production. This type of steel contains carbon to the extent of 0.3 % – 0.6%. Because of the high density of carbon present in the metal, products built from the use of this metal are usually strong and free from wear and tear. Medium steel is usually used in the production of automotive parts which makes up the end product’s durability and the ability to last long. High carbon steel is very strong since 0.8% of carbon is present in it. This type of steel is extremely strong and usually used to manufacture wires and strings. A sub category of this type of steel is ultra high steel which is quite hard. This is the reason why ultra high steel is used for purposes outside the industrial area, because they are prone to break quickly due to their hardness. Axles, knives and other types of hard materials, which are used daily, are made by utilizing ultra hard steel which makes up for their durability and strength. As you can see, steel is divided into three basic categories, all of which have different functions and are used to meet different requirements. We have been able to provide one of the finest UK steel profiles services to our customers. 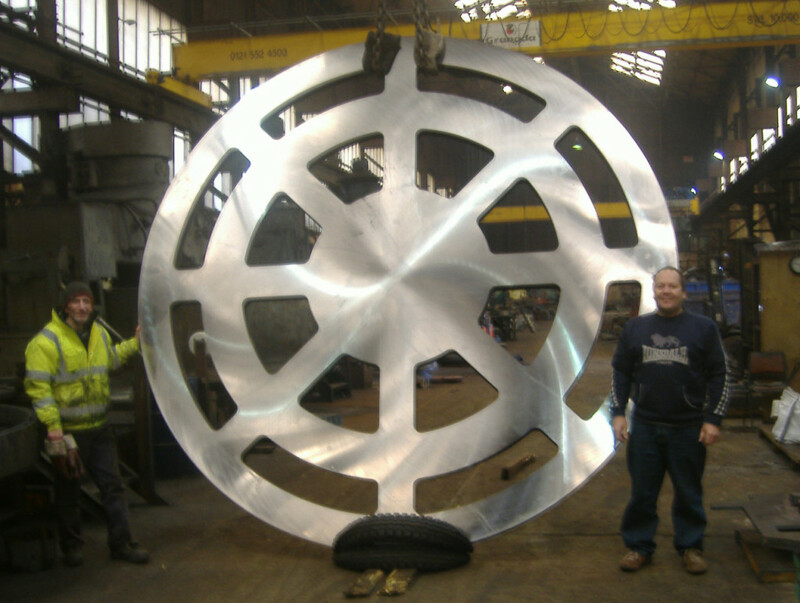 We use the technique of oxy-fuel cutting to achieve the customer requirements of melting and welding metal. The method of oxy-fuel cutting works by liberating oxygen to facilitate in the melting and welding process of the metal. Since oxygen facilitates the burning of the fire, this process uses oxygen as a fuel to prepare the finest UK steel profiles. It is cheap and effective. The reason it is highly recommended and commonly used by small scale industries and households to mend and repair metal related products is its effectiveness and inexpensive nature. Despite the fact that the process of oxy fuel cutting does not require high investments and training, we make sure that our equipment is in great working condition and our staff has undergone regular training to update and refresh their skills. We have planned trainings for all our employees and we make sure that all the employees conform to the rules. We also encourage and take feedback from our employees to understand the concerns of our customers. This way we improve and better meet the changing requirements of our clients. We also have Lumsden grinding machines which we make use of when our clients require the same. We use this machine to meet the requirements of low surface smoothness and precision in the UK steel profilers. The machine uses a fixture to keep the target metal in place. Once the metal is in place, the grinding machine is run over it. The process produces a lot of heat as it uses the technique of abrasion to release the metal. Since the metal can lose its shape if is not cooled, the Lumsden grinding machine has a coolant installed in it. This helps cool down the metal and thus, it helps the metal keep its shape. Also, it protects the user from the damage that this exorbitant amount of heat that the process produces might bring. Therefore, we make sure that the machine undergoes regular servicing and is working efficiently. Only after we are certain about it safe running do we allow the handling of the machine by our employees. Our UK steel profiles have made a mark in the industry and we are proud to say that we have a loyal base of customers that is increasing every day.